Engineer Brian Waite is a man on a mission ­ a mission to convert people to the merits of houses made from straw. It’s not as daft as it sounds given he’s utilised his own patented construction method to build a two-storey home that's virtually zero energy with a neglible carbon footprint. 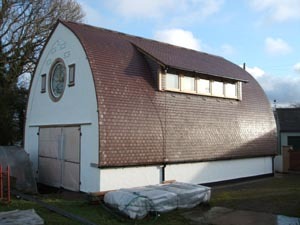 It’s also a major accomplishment given that the Strawbale House is located in Cockermouth, Cumbria, one of the wettest and windiest parts of the UK. After several years of perseverance and much hard work the house is now almost finished, with any questions about its strength and weathertightness dispelled by its crowning glory of dark heather clay plain tiles from Dreadnought Tiles. 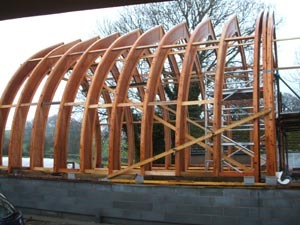 The supporting structure of the property comprises a series of wooden cruck frames with metre-long straw bales packed tightly between to form the continuous walls/roof and insulation of the property. The frame and bales are retained by a patent-pending mechanism designed by Mr Waite, who carried out much of the construction work himself. Early in the design phase Mr Waite ruled out the use of eaves overhangs, an established method of protecting properties from the weather, opting instead for a high quality roof tile and a ventilation system that wicks moisture away from the lime render. Planners played their part in influencing how the scheme progressed and its final appearance, initially stipulating that the roof covering should be slate to match the local vernacular. However, due to the curvature of the roof, small format tiles were required, ruling out slate. 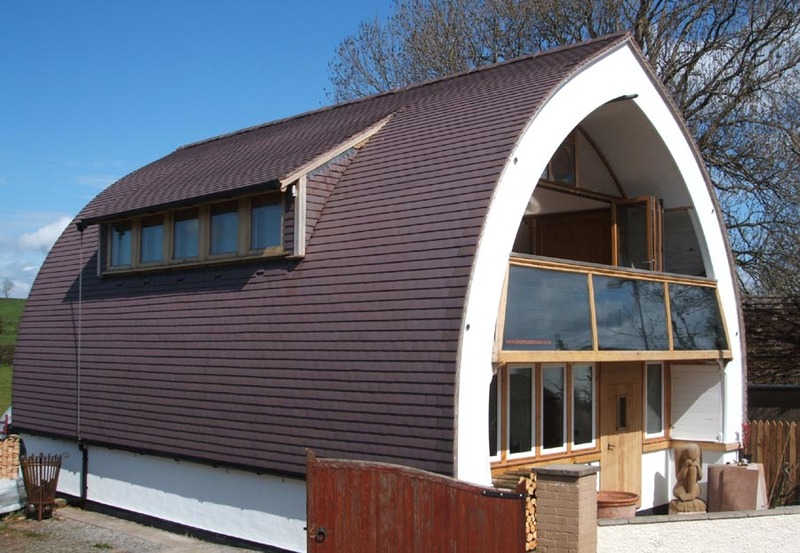 Mr Waite wished to use only British made product and Dreadnought’s Dark Heather roof tiles matched the specification and satisfied the local authority, with some 7,500 supplied for the project. The Dark Heather tiles wrap over the house to just one metre above ground level, providing a good-looking yet tough exterior that will last for decades. “This project highlights how plain clay tiles help to deliver the highest level of sustainability,” said Alex Patrick-Smith, Managing Director of Dreadnought Tiles.